Why do we see colors with our eyes closed? When you stand outside in natural light, you can see your surroundings because sunlight has traveled almost 93 million miles — bouncing around in the atmosphere, pinging off windows and ricocheting off leaves — to enter your eye. And that light is made up of tiny packets of energy known as photons, which are subatomic particles. You and most other animals on Earth are able to see because your eyes all work on the same basic principle: light travels from a source, enters your eyeball, hits the photoreceptors at the back of your eye, and those photoreceptors turn the energy from photons into electrical energy, which your brain can then assemble into an image. It’s an amazing process, but a complex one, so let’s break it down chronologically. Light enters your eyeball. 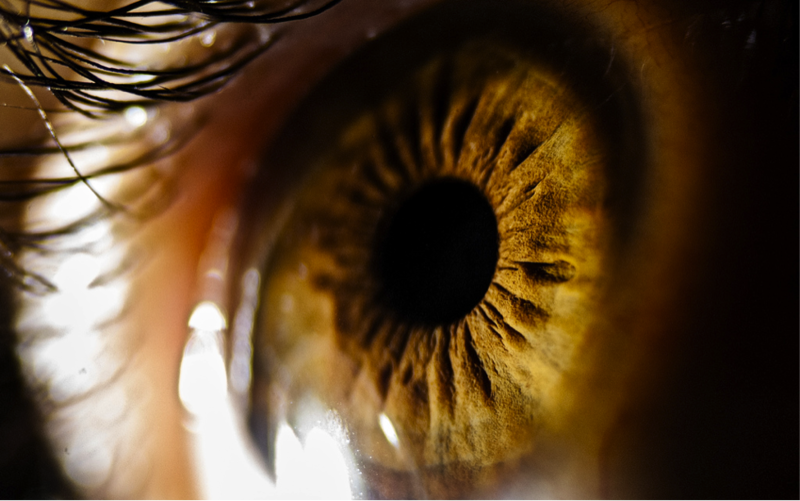 Your eye has a clear window in front called the cornea, which bends the light coming in so that it goes through your pupil — the dark area at the center of your eye. The colored part of your eye surrounding your pupil is called the iris, and it relaxes and tightens to let in different amounts of light. In bright light your iris tightens up so that not much light comes in, whereas in the dark it relaxes so that as much light as possible enters. After light goes through the pupil, it hits your lens, which focuses the incoming light onto the back wall of your eye. This wall is called the retina, and it’s where the light’s journey ends and where things get a little more complicated. Your retina is made up of special cells called photoreceptors. Photoreceptors are long and thin, like the bristles on a toothbrush, and their two ends do different things. The free end is catching photons as they come in, and the opposite end — the one attached to the toothbrush — is sending out an electric signal. There are two types of photoreceptors: rods and cones. There are a bunch of differences between rods and cones, but the most important is that rods are very sensitive to light but don’t give you color vision. Cones are not that sensitive to light, but different types of cones respond to different parts of the color spectrum, so they’re responsible for color vision. All types of photoreceptors send out the same kind of signal, though, it’s just that each type responds to different light sources. But how does that signal get started? It turns out that there is a special protein called rhodopsin inside your photoreceptors that absorbs a photon and uses that little bit of energy to change its shape. Once rhodopsin has changed shape, it interacts with other proteins differently. When there’s no light, your photoreceptors are constantly sending a signal that says, “I’m not getting any light!” But when light comes in, the proteins that used to send out that signal quiet down because they can’t interact with rhodopsin in its new shape. This signal gets passed along to a second cell, which interprets whether or not the photoreceptor is getting any light. When the photoreceptor stops sending its signal, the second cell knows that light is coming in. That second cell tells the next cell “There’s light coming in here!” and that signal gets passed along through a chain of cells called the optic nerve, which connects your eye to your brain. So it’s actually the lack of a signal from your photoreceptors that tells your brain when light is hitting your eye. The part of the retina that the “light is coming in here” signal comes from determines its place in the overall visual input that goes to the brain, says Reena Garg of the New York Eye and Ear Infirmary of Mount Sinai. So the total input from the retina is like bits of a tiny map, rushing through the optic nerve up to a part of the brain called the lateral geniculate nucleus (LGN). In the LGN, the brain pieces together the incoming signal from the retina, says Garg. The signal from the retina gets divided up and sent to different parts of the LGN depending on where on the retina it came from and what type of signal it is — rod or cone. Rod and cone signals tell the brain where the light is located, whether it’s moving, and what color it is, says Garg, and that information helps determine which part of the LGN a signal gets sent to. The signals are then linked to one another to form a cohesive image. The LGN then sends out signals to the visual cortex so that the image can be processed even more. The visual cortex makes more complex mental maps and helps with visual memories and associations among other important tasks. So as you’re reading this article, the different parts of your eyes are sending separate signals about what the page (or, let’s be honest, your laptop screen) looks like, and those signals stay separate from each other until they reach the LGN. There — finally — the signals from all the different parts of your eye get linked together, and you produce a three-dimensional mental image of this page based entirely on electrical signals originating from photons.